Unlimited power. That’s the promise of Fantasy Flight Games’ latest incarnation of the Emperor, and there are few reasons to doubt the claim. Legacies promoted Yoda as its main draw, and he turned out to be every bit as good as advertised. Snoke, the premier Way of the Force legendary, was so good that he needed a nerf. Of course, we also can’t forget Vader3, the reigning champion of the Across the Galaxy meta—a true Terror to Behold. 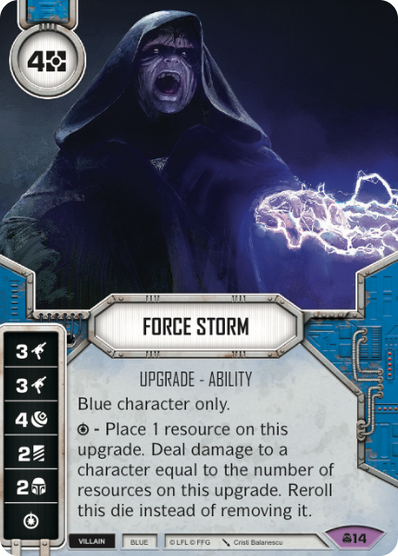 So now, with Palpatine – Unlimited Power, FFG has another big promise to keep. With the help of one Stubborn Gambler, Palpatine seems likely to live up to his card name. I’ve experienced first-hand the skepticism surrounding the new Palpatine, and I’ve seen it articulated in several forms online. However, I’m here to tell you that you should not underestimate the suite of cards surrounding Palpatine and the devastation they can bring. I’ve seen Palpatine put down a Force Storm, a Force Wave, and two Palpatine’s Lightsabers to gain two health and four upgrades—all in round one. While that’s a near ideal example, it’s not unreasonable, either. 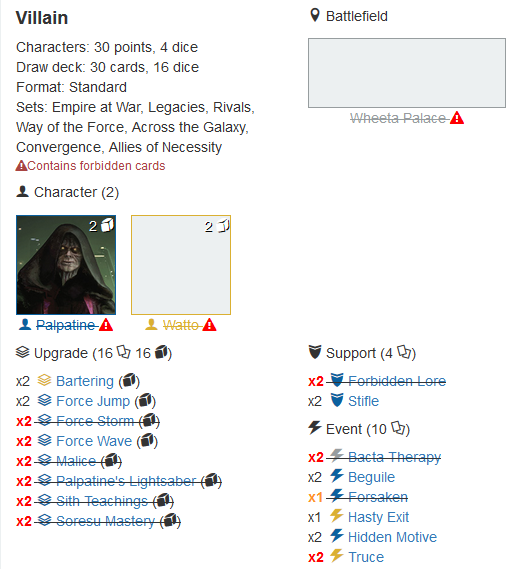 To illustrate this, I’ve written up an analysis of the Palpatine deck I pitched as part of the Dice of Failure’s “Wanna Buy Some Gluesticks?” deckbuilding segment. I’ve tested the list ad nauseam via TableTop Simulator; to use the words of my podcast co-host, I’ve probably tested the new Palpatine more than 99.9% of players. I’ve seen him stand up to a pretty good gauntlet of decks, but you don’t have to take my word for it. Test the deck yourself and submit to the dark side. *Disclaimer: I’m under no illusion that this is the end-all-be-all ePalpatine3/eWatto decklist. Here’s my argument: Palpatine will be only be competitive when paired with Watto. It’s certainly a bold claim given that Convergence hasn’t released and we haven’t yet explored the full possibilities of the Allies of Necessity plot. I stand by my statement, though; if ePalpatine3/eWatto can’t be successful, then no Palpatine3 deck can be successful. Why? Palpatine’s ability—unlimited ability upgrades and one additional health per each one—is difficult to take full advantage of. You need to be able to pump him up with upgrades but still have resources for mitigation (and for high-value pay sides such as the Force Wave special). How do you do that? Yellow has always been the resource-centric color. Truce and Well-Connected have long been staples of resource generation, and new characters like Tobias Beckett and Val have only furthered the color’s reputation. Clearly, there are many strong Yellow cards for generating resources, but Watto is an entirely different beast. 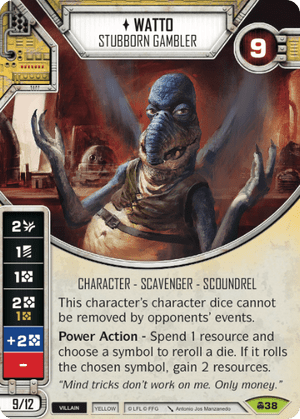 Chance Cube has rotated, but Watto’s Power Action—the ability to net one resource with a 50% chance of success if you use the PA on Watto’s die—is a mini Chance Cube. Plus, his dice alone are resource machines that can’t be removed by an opponent’s events. If you can name another character to pair with Palpatine who can pump out enough resources to fuel Palp’s fire I’ll change my mind, but I’m not holding my breath. With this deck you obviously want to get a ton of upgrades out, but you also want to do damage and mitigate dice. Luckily, just playing ability upgrades works as mitigation. After testing against this deck on Tabletop Simulator, a buddy of mine remarked that I mitigated at least two damage per turn just by adding dice to my pool with upgrades—not a bad deal. Additionally, certain new spoiled upgrades remove dice when you play them. With those, you get to gain health and dice and avoid damage—a wonderful value! This synergy lets you pack your deck full of ability upgrades and skimp on full-on dice hate cards. You run six one-cost ability upgrades: two each of Bartering, Force Jump, and Malice. You also run Sith Teachings, an upgrade that provides situational die removal to turn your opponent’s misfortune to your advantage. Your heavy-hitters are Force Wave, Force Storm, and Soresu Mastery. Force Wave and Force Storm are both prime candidates for Palpatine’s amazing Power Action, as continually reusing those dice is a nasty proposition. During my first TTS game with this deck, I resolved the Force Wave special twice for 10 damage in round 1. Force Storm is the best option, however, as its die will never get stuck on the table since it has no blanks and no pay sides. Plus, it has a special side that can be resolved multiple times a turn for insane ramp. 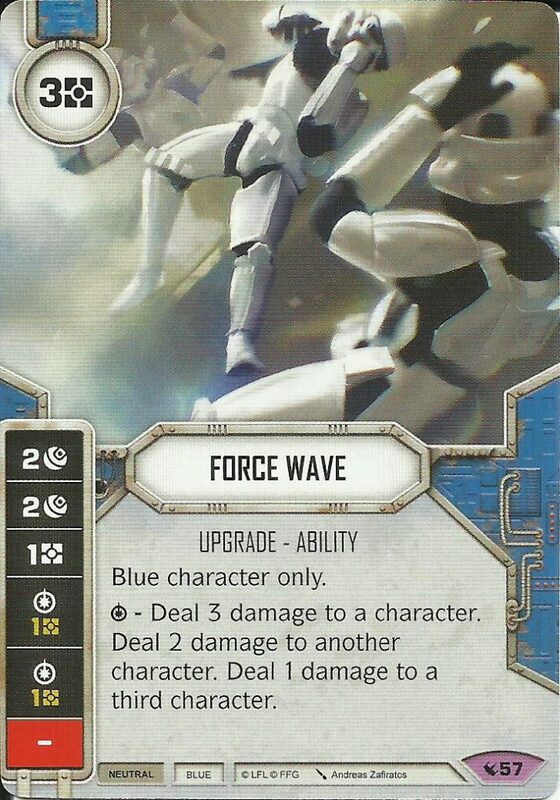 Force Wave and Force Storm are your primary damage dealers besides Palp’s melee sides and Palpatine’s Lightsabers, which aren’t unique when played on Palpatine and are essentially free once you have two abilities on him. My favorite part about these ability upgrades is that all of them are non-unique. If you run two Soresu Masteries, you’ll still have to overwrite one to play the other, but the free damage die removal might make the play worth it. As a side note, the general rule with Palpatine is to never overwrite; use Watto so you can afford the additional upgrades instead. The more upgrades, the better. The smallest part of this deck might be the most important. 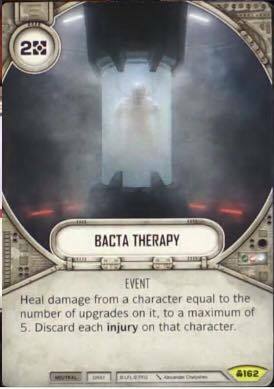 The tech cards in this list are Forbidden Lore, Bacta Therapy, Stifle, and Truce. Forbidden Lore is an obvious choice. The free cost reduction on an ability is awesome, and the card draw is tasty icing on the forbidden cake. Stifle is key for stopping pesky mitigation on your Palp dice. Truce is awesome for when you need that extra resource. What’s wrong with more money? Lastly, we have to talk about Bacta Therapy. It costs two resources and heals damage equal to the number of upgrades on a character, up to a maximum of five. With Palpatine, this is often a two-for-four or two-for-five exchange, which is really good. In one game I healed 10 damage from Palpatine across two rounds. 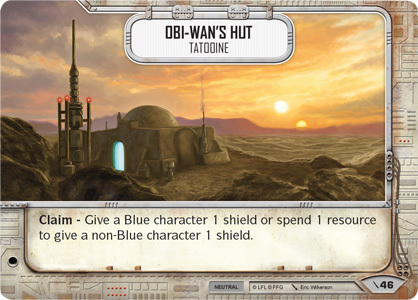 I think people look at this card (and Palp’s suite in general) and ask “how are you going to pay for it?” with the assumption that there isn’t an answer to the question. As we’ve seen, however, there is. Mitigation is the most fluid section of this list, and I likely won’t have it nailed down for quite some time. If you’re building this deck, you should go with what you think works. Whatever your combination, though, I think six dice removal events is the maximum you want to run. 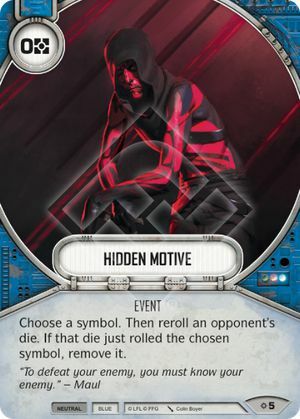 This may seem a little light, but as we’ve already gone over, this deck is oozing with hidden mitigation; Force Jump, Bacta Therapy, Soresu Mastery, and Sith Teachings all provide it while also increasing Palpatine’s health. Despite this, you still run playsets of both Hidden Motive and Beguile. Zero-cost cards are very important since you want to save your resources for abilities. As far as choosing other additional mitigation cards, you have a lot of options. One card you might be able to work in is Forsaken. Palp’s Power Action gives you a good way to get just one die in your pool, and it functions like a zero-cost Electroshock when you can play it. Alternatively, Hasty Exit is great when you get it in the opening hand (since you’ll probably win the battlefield) and is a nice way to take some early heat off while you ramp. 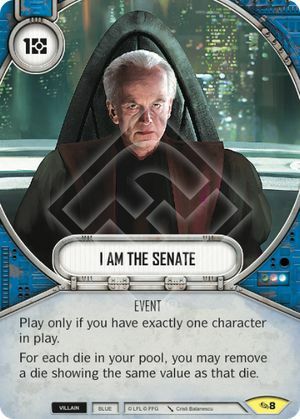 On the other hand, a card like I Am The Senate could absolutely devastate your opponent in the late game. But what if you draw it early? What if they don’t go for Watto first? 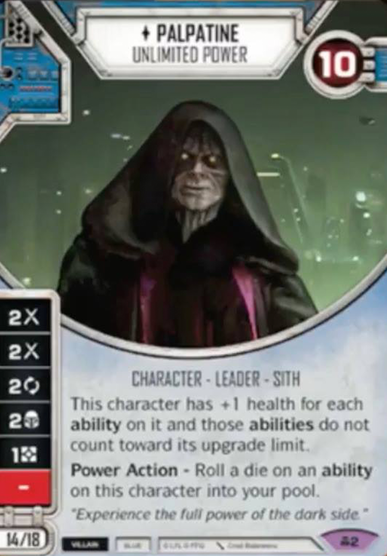 The card may also encourage you to roll out early, which isn’t ideal since you want to always be putting more abilities on Palp. If everything works out, I Am The Senate is great and a total game-wrecker. However, there’s so much uncertainty about it that I’m not sure it’s worth a slot that could be taken by something more consistent. That said, I haven’t tested with it much, so I’m eager to find out! Originally, I tested this build with Theed Royal Palace, and it was wonderful. Palp’s die has four sides with a value or two or more, and Watto’s die has three sides with a value of two or more. This is literally (actually literally) the best value you can get with a four-die start. The only other characters with at least two value on four sides are Vader3 and Palp1, and neither of them can be paired with an elite character who provides the same value sides as Watto. As such, you have a great chance of winning the roll-off. While that was great with Theed, the word on the street is that Theed will be nerfed into the ground. Does that significantly dampen the potential of Palpatine? I don’t think so. Watto can pump out five resources by himself, so the loss of one isn’t huge. But what to replace it with? 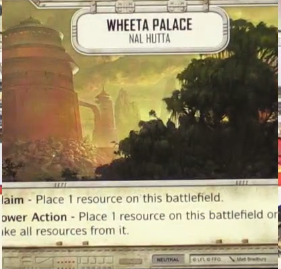 Wheeta Palace seems like a logical replacement, but you may just be effectively giving your opponent a Theed for the rest of the game, as you probably won’t be Claiming against most decks. Theed currently has the same issue, but the first round advantage has always been worth it. To avoid the problem, you might go with Obi-Wan’s Hut for continual Palp shielding. Not every battlefield for Convergence has been spoiled yet, so it’s possible something still unknown will knock my socks off. As someone excited about the new Palpatine, I am a bit resentful of Mind Extraction. It seems like such a silver bullet—the kind that Snoke, Vader, and Yoda never had. Sure, they all had cards that were good against them (except arguably Snoke), but nothing seemed specifically designed to ruin them. 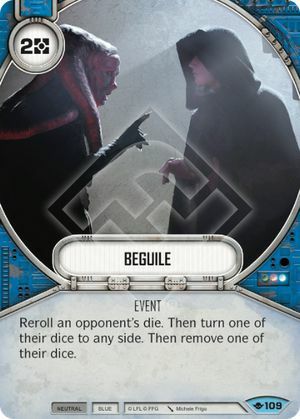 Unshackle exists, but the damage Mind Extraction does to Palpatine is done the moment it is played, meaning Unshackle is a mere bandaid on a gushing wound. That said, there’s a good support for the argument that Mind Extraction doesn’t immediately mean the death of Palp. Of course, if he has 10 or more damage on him it instantly kills him, but I’ve never had more than 10 damage on Palp and still won the game. If you get to the Mind Extraction insta-kill point, then you’ve probably already lost. 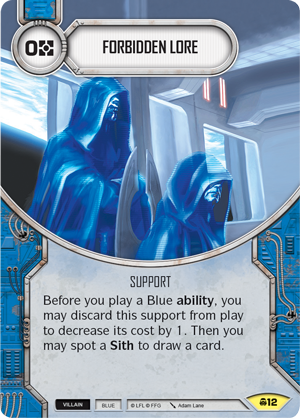 If your opponent isn’t straight up killing Palp with the card, then they’re only slowing him down. 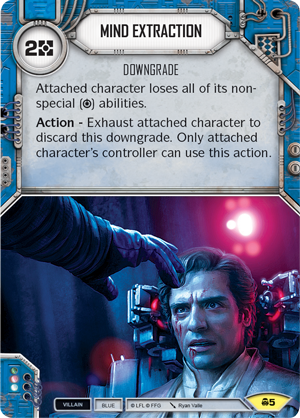 Mind Extraction still leaves him with three upgrades and the ability to discard the downgrade. Plus, drawing a Mind Extraction in the first round would be pretty ineffective. As such, it’s probably only a one-of in most decks. The bottom line is this: I don’t know yet how much Mind Extraction will hurt Palpatine, but I know that ePalp3/eWatto will be good enough to force Blue villain to run Mind Extraction. Once again, don’t take my word for it. Test this deck; these dice won’t fail you. If you find something you want to add into or take out of this list, let me know how it works for you. There are good arguments for cards like Free-For-All, and a whole unseen meta against which to tech, so this deck is by no means set in stone. Just do it!